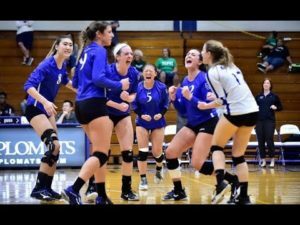 The battle to earn one of the top four spots first to make the Centennial Conference playoffs is coming down to the wire in the final stretch of the volleyball season. Franklin & Marshall and Johns Hopkins are both eying the number 1 seed, while Muhlenberg, Swarthmore, McDaniel, and Gettysburg are all in reach of securing the 3 or the 4 seed. Franklin & Marshall is currently in first place in the Centennial Conference. With only two conference matches left to play the Diplomats are undefeated with an 8-0 record against Centennial Conference competitors. The Diplomats have been unfazed by many of their conference opponents, sweeping two teams in only three sets and defeating four teams 3-1. Franklin & Marshall also showed impressive grit and persistence in its two come-from-behind victories against Swarthmore and Gettysburg. However, the ride to first place is not obstacle-free for the Diplomats. Johns Hopkins, the 2017 Centennial Conference champions, is currently in second in the conference with a 7-1 record. The two teams have been neck-and-neck in the fight for first place from the beginning of the season. Going into the month of October, both teams were undefeated with a 4-0 record. However, the Johns Hopkins Blue Jays lost their first and only match of the season so far on October 3 in a surprising upset to the now seventh place team in the conference, Dickinson. Johns Hopkins has 2 conference matches left to play. They first must face-off against Gettysburg, a tough competitor that had defeated Dickinson early on in the season. Then, in their last match of the regular season on October 27, the Blue Jays will compete against the Diplomats, a must-see. If Franklin & Marshall defeats Bryn Mawr, currently the last place team in the conference, on October 20, then they will be going into their final match against Johns Hopkins 9-0. If the Blue Jays defeat Gettysburg on October 4, they will be going into the match against the Diplomats with an 8-1 record. Therefore, this final match could end up determining the seeding of these top two teams. Muhlenberg and Swarthmore, the current third and fourth place teams, respectively, are both 5-2 in the conference. With 3 conference matches left to play, Muhlenberg must face-off against McDaniel, Swarthmore, and Washington College. The match against Swarthmore on October 24, could determine whether the third or fourth place seeding for these teams. Both McDaniel, fifth in the conference, and Gettysburg, sixth in the conference, could make a run for the four seed. McDaniel is currently 5-3 with two matches left to play against Muhlenberg and Dickinson. If McDaniel can pull off the upset against Muhlenberg and can defeat Dickinson, they may have a chance to squeak by into the playoffs if Muhlenberg also loses their match against Swarthmore. Gettysburg’s path to the playoffs may be a little more difficult though not impossible. With close 3-2 loses against F&M and McDaniel, Gettysburg has proved they have been able to battle with tough competitors. However, in order to earn their spot in the playoffs they must battle and ultimately defeat tough competitors including Swarthmore, Johns Hopkins, and Dickinson. Teams must compete at their best in their final two to three conference matches as these matches may crucial as to who gets the chance to fight for a Centennial Conference Championship.